The Belfry is a historic golf resort, having hosted the Ryder Cup no less than four times on its legendary Brabazon Course, it is arguably the home of golf in England. The Brabazon is, of course, the headline layout, with the chance to walk in the footsteps of Europe’s golfing heroes on the bucket list of many players. The other two courses, the PGA National and the Derby, are the perfect supporting acts and worthy of a round in their own right. Located in the heart of England, surrounded by the enchanting Warwickshire countryside, The Belfry is in an ideal spot for golfers across the UK, with Birmingham just 20-minutes away. The resort’s hotel is on par with the quality of the golf courses, with only first-class service and comfort throughout. The excellent on-site facilities include a Health and Wellness Centre, AquaSpa, a choice of quality eateries and the legendary Bel Air nightclub. Book a Last Minute Deal at The Belfry now from £139.00pp! 1 in 16 Go Free! We found 13 offers matching your search. Option to swap 1 round for Dinner! Option to swap round at derby for dinner! The Brabazon course is without doubt the main attraction at The Belfry. As a four-time host of The Ryder Cup, more than any other course, this famous layout is steeped in Ryder Cup history. Who could forget Christy O’Connor’s famous 2 iron to the final green in 1985? Or Sam Torrance's 18th hole heroics just four years earlier; or the jubilant Paul McGinley sinking the winning putt in 2002? As you might expect, the course itself is a fine test of golf too, where the excitement comes from playing iconic and familiar holes. The par 5 3rd is a cracker thanks to the work of Dave Thomas, who carried out renovations in the late 90s, and of course there are iconic holes such as the par 4 10th. Seve drove the green back in 1985 and ever since, that’s been the play for many a player with enough firepower to carry the water short and left of the green. Even if you lay up with your original ball, tee up another and have a crack; it would be rude not to! Just like the 10th, the closing hole on The Brabazon is a thriller, totally defined by the almost overwhelming presence of water short and left of the green. This is a classic risk vs. reward par 4 where players can choose to be brave, hugging the left and cutting off some of the water from the tee, leaving a shorter approach shot into the green, which must carry the lake to find the long, slender green. The iconic moments on these famous holes are what make a round on The Brabazon Course so special, and should inspire every golfer to visit and experience that legacy. It’s a bit of a tossup between the iconic 10th and 18th holes on The Brabazon but we all love a great risk vs. reward short par 4. The choice is simple: either hit a long iron or fairway wood into position or, if you have the required length, go for driver and try to carry the water short and left of the green in order to set up a good chance for birdie. With so many classic Ryder Cup moments having taken place here, there’s a real sense of excitement when you step onto the tee. The 10th is one of the most picturesque holes on the course too so regardless of how you choose to play it, you’ll be sure to enjoy the challenge. The PGA National course opened for play in 1997 to strengthen The Belfry as a golfing resort and ease the traffic over the world famous Brabazon Course. Since then the PGA National has established a superb reputation of its own, hosting the Seniors European Open tournament, and was the 1st course in Europe to carry PGA branding. The main feature of the course is the tremendous bunkering, designed to protect the large, undulating greens and when you add it all up, the course presents a stern challenge very much in an American Stadium style. A number of newly constructed lakes – water comes into play on no less than 8 holes so pack plenty of balls! – and manmade mounds provide definition to the holes and while the PGA National Course has clearly been built with tournament golf in mind, it offers an entertaining test from start to finish. From the championship markers, the PGA National stretches to over 7,000 yards but fear not; multiple sets of tees on each hole allow all golfers to find their comfort zone. Still a relatively young course, The Belfry’s second championship course is sure to continue maturing in the years to come. The 4th on the PGA National Course offers drama and demands good accuracy and course management from tee to green. You can choose to play safe from the tee, hugging the right hand side of the fairway but this leaves a long and difficult approach shot into the raised green which is well protected by 4 bunkers which aren’t visible from the fairway, and are ready to catch anything coming up short. Braver players can take on a forced carry of about 220 yards to the left portion of the fairway which leaves a much more manageable approach but with water all around, there is risk a plenty. There are no places to hide on this hole and there won’t be many undeserved pars being handed out either. The Dave Thomas designed Derby Course at The Belfry was opened alongside the Brabazon in 1977, and while it might not rank alongside the two championship courses at the resort, it’s an excellent alternative for higher handicappers, or for those looking for a more relaxing experience than a round on a long championship course. With a par of 69 and a more manageable total yardage of 6,099 yards, the Derby can be enjoyed by any standard of golfer, with fewer hazards in play than on the PGA National and Brabazon Courses. Did You Know? The Derby Course at The Belfry was named after the Earl of Derby. In a similar vein, the more famous Brabazon Course was named after Lord Brabazon of Tara. The 16th on the Derby Course is a picturesque par 3 which demands a solid tee shot thanks in large part to the water hazard that guards the left hand side of the green, as well as the bunker that guards the right. The kidney shaped green offers many pin positions, some of which can be really treacherous if you have designs on taking on the pin. Playing safely for the centre of the green is the prudent play here and par is always a good score. The Belfry is home to some of the finest practice facilities in the country and visiting golfers can benefit from world-class tuition at England’s only PGA branded Golf Academy. Practice / teaching facilities at The Belfry include a 34 bay floodlit driving range, a superb putting green and dedicated short game practice area, as well as 5 individual custom fitting suites where golfers can make use of video analysis and launch monitor technology to better understand their games. Named after Sam Torrance, who of course holed the winning putt at The Belfry in 1985, as well as winning as a Captain here in 2002, Sam’s Bar at The Belfry is a great place to enjoy a bite to eat or a well deserved drink after your round. With an elevated seating area, golfers can also relax while gazing out over the courses and during the summer months, a cold beer al fresco style on the terrace is hard to beat as you watch golfers coming up the 18th, as well as taking on the exciting tee shot from the iconic 10th hole on the Brabazon. A fire pit ensures you can enjoy al fresco dining even after the sun has started to go down. NB - Reservations cannot be made for Sam's Club House but with ample space, it is very likely you will be accommodated. The Belfry recently undertook an extensive £26 million refurbishment programme which has restored the hotel and the resort facilities so that they match the quality found out on the courses. Despite being set in 500 acres of tranquil countryside, The Belfry is just a short drive from the centre of Birmingham and can be easily accessed from the M6 and M42, not to mention being just 20 minutes from New Street Station and 10 minutes from Birmingham International Airport. If you’re leading a life of luxury, the resort even has its own Helicopter Pad. While the courses are relatively flat and easy to walk, those who want buggies should book well in advance and check on buggy restrictions in relation to course conditions. The Belfry boasts 324 guest bedrooms, ranging from the more comfortable standard twins and doubles through to their superior rooms. For a particularly memorable occasion, there are 11 spacious suites and the Presidential Suite. The guestrooms are tastefully decorated and well-furnished, while many offer excellent views over the manicured gardens or the golf courses. The 550 acres of Warwickshire countryside make for a sublime backdrop, while spending time in the hotel will evoke memories of the superb Ryder Cup matches to have been staged at The Belfry, particularly when you pass the European and American team rooms, where so many rousing speeches have been delivered. This special atmosphere pervades the whole resort, and only serves to improve the experience of your golf break at The Belfry. Health & Wellness at The Belfry offer a range of facilities that include a swimming pool, sauna, steam room and spa pools. In addition there’s a state-of-the-art gym with a range of TECA equipment from Italy, fitness studio, tennis and squash court. Relax in the AquaSpa, a 90 minute journey through a series of 12 zones, experience hot and cold sensations with cleansing steam, piercing ice showers, aromatherapy mood lighting and a multi-featured hydrotherapy pool. For a more formal dining experience, The French Grill offers a superb menu featuring modern European cuisine and overlooks The Brabazon course. Furthermore, the buffet on offer at The Atrium offers an endless array of delicious classic dishes. Following a round of golf, try Sam's, which is ideal for the hungry golfer. Alternatively head to the Belfry Bar for a drink, before moving on to the legendary Bel Air nightclub for a lively evening’s entertainment. Had a great time at the Belfry - first time there. Great atmosphere - lovely course , helpful staff. Overall i enjoyed the weekend. Would probably go again. Hotel is very pricey for food and drink. The hotel is superb; exceptional decor and facilities and helpful staff. The breakfast, lunch and afternoon tea were good but the buffet dinner let it down. The emphasis seemed to be on the quantity of choices rather than the quality of the food. I would try a different restaurant next time. Fantastic. Staff couldn’t have been friendlier and helpful. Offered to oversee our clubs while we had a drink before round on day 1. We were allowed to check into the room 5 hours before check in time. Then arranged a taxi to a nearby curry house which they also booked. The rooms were clean and pleasant, no complaints. Sams bar was great for watching the football after the round on day 1 and reasonably priced. Upon return from the curry we went to Bel Air which was far busier than we expected. Unfortunately it wasn’t the younger crowd (20-25) we were hoping for and was mainly middle aged adults. It was still very fun with a large amount of cheesy and pop music. The main bar in the hotel had a great atmosphere for a late night whiskey or two. Breakfast was well presented and tasty for our 9:10 tee off time and check out was very efficient. Overall the hotel is well equipped for the golf clientele with lots to do in the evening in the many bars, restaurants and leisure facilities. We had a fantastic time and considering making it an annual trip. The accommodation was excellent very clean, staff was friendly welcoming and professional. I thought the drinks coffee tea and beer was a bit pricey but overall the hotel was excellent. For one night the rooms were adequate, although they seemed to be set up for one person. Only one glass, towel and shower gel. It was no problem getting them as we only had to ask and they arrived promptly. The open fire was a lovely welcome when we arrived from a chilly round of golf. the hotel room let the whole stay down as there was a smell in our room as we entered it, and we later found it to be the blocked drain once i took a shower which then caused the whole bathroom to be flooded. I Called the receptionist and informed them but no maintenance came to the room so it left my colleague without a shower after a round of golf in the rain which didn't make him happy. went straight down to the front desk and told her again and said that it will get sorted. we then went out for a curry off site and came back to the room still smelling and that the blockage had been resolved but the shower tray was left with all the black dirt/sludge etc and the toilet had the paper towel which they had made some sort of effort to clean it but hadn't flushed. with this then made me gag. this let the trip down. The hotel was great, the rooms were big and clean, very comfy and only a short walk to the gold club. The one thing that was disappointing was the prices in the golf bar. I paid £10 for a chicken wrap which I was expecting to be filled to the brim and filling itself but very disappointed. I would however recommend paying the extra £10 to include dinner if you go on a dinner B&B rate. It was an all you can eat buffet that was delicious! 100% recommend this rather than the golf bar. Great room brilliant staff. Food at the bar was fantastic. Great room pricey drinks. Ate in the restaurant which offered a la carte and buffet. Service at the a la carte was painfully slow. Choose the buffet it was good quality, cheaper and much quicker! Good clean room would have liked a bath but was still adequate. Very good breakfast. Rooms were great and comfy, bar/restaurant service good, but bar atmosphere not the best and extortionate prices!! I was disappointed with the room which was small as was the bathroom. Also only one bath towel between 2,we had to ask for more towels. When we tried to ring reception the phone was not connected and had to make the call from mobile. Nice clean room.... Long walk to the bar. Ok going,harder finding it on the way back...🍻 Staff were brilliant all weekend. Very good overall. Couple of bad points: our shower leaked badly. Staff weren’t very good in the bar. We were put up in one of the out buildings which are designed for large groups of golfers. Room was very cold although heating did eventually come on in the morning. Room itself was a good size, had a good shower and plenty of cupboard space. As usual with these hotels drinks are way overpriced - £5 for a coffee!! Never thought a motorway service station coffee would seem cheap. Hotel has excellent facilities, plenty of parking and excellent staff. The Belfry runs like clockwork, reception and golf shop absolutely brilliant. Drink prices normal city quality bar, food on the crazy side £12 cheese and ham toastie. Great hotel . great food . drinks are massively over priced in all the bars and so is the drinks cart that pops roundon course. Iv done this package a few times and before and have enjoyed my stay ! But this time I thought the food in the Ryder grill wasn’t as good! As for the rooms they were ok ! And I was woken up at 4:30 in the morning due to the garbage men working for a full hour ! But the golf makes up for all the negatives ! Great courses ! We both loved being at The Belfry. The whole atmosphere of the hotel, the excellent facilities, our bedroom and most of all the magnificent golf courses made it a dream come true for us because we are such avid amateur enthusiasts of golf. The layout of the two courses we played – The Derby and PGA National – were both so different, but so fantastic too...we couldn't fault either and even managed to play fairly well much to our surprise. We loved the brilliant screens in the buggies too, giving us all the desired information regarding, yardage, warning us about where to place the ball, scoring etc. In fact anything we wished to remind ourselves about the course was there to view on the screens. We found The Belfry so attractive and pleasant but also exciting. Our accommodation was superb, the staff were so helpful in every way and the location of the whole complex so very easy to find, so well signposted for visitors. We would have no hesitation in recommending the hotel, facilities, golf courses; in fact the whole package which we got from Your Golf Travel. In fact we’ve already have done so to a number of our friends. We can't thank YGT enough for all your help & speedy information. We can't wait to get back to you for a future golf holiday. A great venue with 3 good courses. Brabazon is a top course and the Derby is an easy walk round, with the PGA somewhere in between. Hotel rooms aren't the best and some can be a little noisy. Staying in the lodges out in the grounds is better option. Fantastic venue with 3 different courses. Great facilities and great food. From golf to other leisure activities, a great place to stay and relax. My Caddy Tip - "Play within yourself, don't be greedy. Plot your way round." On, the 9th and the 18th take half a club more. My Caddy Tip - "Use a soft ball and a light putter." The tenth on the Brabazon was my favourite. Hotel undergoing refurbishment, so a little inconvenient. However, this was balanced by a great golf course- the 9th and 18th are my favourites. The 18th hole on Brabazon is the perfect challenge. Everything about our stay was fantastic, apart from how windy it was. The Brabazon was in top condition for the time of year. Most of the daily tees were being worked on so we played mainly off the medal tees. The room was excellent as was the food in the Ryder Grill. My girlfriend who doesn't play golf had the afternoon in the spa and said the sports massage she received was fantastic. My Caddy Tip - "Be straight." The place just oozes golf. Great atmosphere, everyone was very friendly and I just cannot praise the place enough. The 10th hole on the Brabazon was fantastic, I would take plenty of balls. The hotel was also brilliant, with the only negative being the price of the drinks. Otherwise, our stay was great and I will be going back if I have my way. My Caddy Tip - "Just enjoy your self." I've been there 3 times in the past few years and every time I return it just seems to get better. I am in the process of possibly making a booking for approx 16+ for spring next year through Your Golf Travel. Can't wait, roll on spring. Most of the holes were brilliant. My Caddy Tip - "Don't read much into the greens." The hotel is recommended. All the courses are in great condition and I recommended it. Hotel revamp impressive. However, we were pushed round an empty course by a marshal on a windy wet day, which really spoilt the experience. I would like to return with my group of ladies in the near future. Play the Brabazon and PGA. The Derby is not anywhere as good. My Caddy Tip - "Look up and enjoy the scenery." Really great venue- golf, accommodation, food and service all top notch. Brabazon is a real challenge but you don't always need a driver off the tee, a 3 wood kept me out of trouble on numerous holes. Favourite holes- 10th, the drive-able par 4 over water, and 18th, where you really need a draw. My Caddy Tip - "3 wood off some tees." Hotel was fine and the food good. My Caddy Tip - "Tricky greens on 10, practice all putts as there is no easy hole." Played the Brabazon and PGA, both of which were in fantastic condition bearing in mind it was really cold. Just a great golf course, playing part of history always gives you a buzz. The Brabazon is always in top condition, no matter what time of year you play. We played the PGA course the day before, and it was also a really fantastic course which again, will test your golf. Fairways on both courses are a must off the tee. This has been my 4th visit on the bounce and I look forward to it every year. I also must mention that YGT has everything spot on. I have booked my Captains trip 2016 for 56 members through them, they just cant do enough to make sure you are happy. My Caddy Tip - "Hit fairways, greens tricky." Favourite hole was the 3rd and then the 17th, both par 5s. I hit big and par 5s are usually my favourites. I found the 3rd the most challenging hole- take on the water. On both holes, be confident. The hotel is very comfortable and the food was great. My Caddy Tip - "If you think you can make the 10th in one, go for it! It is a fun part of the game." Better than expected, good condition. Great service. Fantastic value for only £99. Greens were immaculate for that time of year, even the uphiller's were scary. Great food, great rooms, great location. PGA national was a decent course too. Surprised how 'lived in' the Brabazon seemed. My Caddy Tip - "Don't leave yourself downhill putts!" The 10th stands out as a challenge to hit the green with your tee shots. Although, 18 is a superb hole, with a really good drive required to enable an easier approach shot over the lake to a tiered green - fabulous. My Caddy Tip - "Practice green is a good reflection of the actual greens on the Brabazon." Every hole on the Brabazon was brilliant. Just enjoy it all. Hotel was very relaxing. My Caddy Tip - "Lay up." The course was in great condition and the hotel and room were lovely. My Caddy Tip - "The greens are very tricky and fast." The course starter on the PGA national course was grumpy and didn't say anything other than "can I have your ticket". The rough on the PGA course was ridiculously high. It was actually above our knees, which caused slow play and made it less enjoyable. The hotel was ok but check in was painfully slow. The drinks prices were also ridiculous, more expensive than Gleneagles, Celtic manor and to all the golf resorts we have been to. The Brabazon was much better. I would play that course again but not stay. My Caddy Tip - "Take loads of balls if you are playing the PGA national as the rough is stupidly long." Hotel was nice, but a bit noisy around midnight, which was a little disappointing. My Caddy Tip - "A good idea to have a GPS utility." Cannot fault anything about the whole experience from booking the trip, the hotel, fantastic service, accommodation and of course, the golf itself. Would recommend it to any golfer regardless of handicap. Will definitely be booking our next trip with your golf travel. The tenth and eighteen were very good on the Brabazon and the PGA course was very good. The hotel was also great. My Caddy Tip - "Keep it straight as the rough is very tough." Played the Brabazon and the PGA National. Both are great courses, but the Brabazon is just very special. A great test of golf on a golf course in great condition. All staff are very friendly and the accommodation is first class. I will definitely be returning in the near future. Highly recommended. My Caddy Tip - "Play more club for the approach shots. Try and take the hazard out of play." This was our 2nd trip to The Belfry organised by YGT. The courses were in superb condition, the accommodation was first class along with the food. The staff were very friendly and looked after us very well. We will be going back again. My Caddy Tip - "Don't be over ambitious. Keep it safe." Obviously the 10th and 18th on the Brabazon were my favourite. My Caddy Tip - "Always take plenty of club, it plays its full yardage." Main course great. Hotel and facilities smashing. Meals superb. If only we can all make a suitable date for a return visit. 18th was my favourite, as I could imagine the crowd surrounding the green on the approach shot. Party of 36 went to the Belfry in 2012, we played the Brabazon and Derby courses. We had a fabulous time so booked to go back in 2013. This time we played the Brabazon and PGA courses and everyone agreed this was the best package. The recession appears to have kicked in because the free bag tag given out first time round was no longer available, there were less staff to organise and the quality of the food was not as good. Booked Celtic manner the following year and I would recommend that before the Belfry. My Caddy Tip - "If you've got a card going, lay up on 10 and 18." The 10th and 3rd were my favourite holes. All of the holes were brilliant, especially the 9th & 18th. Play the Derby first to warm up to the other courses. My Caddy Tip - "Bring plenty of balls." I did not go, but the chaps that went really enjoyed the experience, despite some of them having been before. This was for my sons 40th birthday. Had a wonderful time at the Belfry but with one reservation. The Brabazon course was great (as expected) - only lost one ball in the water (not as long as Seve!). The Derby was a disappointment - we were unfortunate to visit just as the greens were being hollow-cored (if we had known in advance we would have tried the PGA National instead). The building work going on did not disturb us but did mean that the pro-shop was decanted into a small space. The staff both in the hotel (reception and bars) and at/transporting to the first tees were helpful and friendly. My Caddy Tip - "Be prepared to lose a ball (or two or three) in the lake." Favourite hole was the 10th. Hotel was adequate, the buffet dinner was good and had a variety of choices. Had a great weekend of golf but the hotel was being refurbished at the time. My Caddy Tip - "Take it all in and enjoy." The golf arrangements at The Belfry were very efficient, and the course was excellent. The hotel was good and the evening meal and restaurant service was very good. We certainly intend to go again. My Caddy Tip - "Make certain that you clear the water." Accommodation could have been better. Favourite hole is the 10th, which I eagled this year. However, my best shot has got to be on the 2nd hole, where I hit my driver off the tee and pitched on the green and lipped out, as I was told by the group in front. My Caddy Tip - "Hit a driver every time on 10th." Both PGA and Brabazon were fantastic courses, the greens and fairways are in top condition. Best courses I have played. The hotel was fantastic and staff all round were happy and friendly. Great if you want to wait on every hole for players who think they can play golf. I will never play there again. We walked off in disgust even having rung for the caddie master to sort it out. I love the eighteenth hole of the Brabazon Course. I played all three courses and they all have their different challenges. The hotel is excellent, all the staff are very friendly. This is my second stay of eight days there and I will go again. My Caddy Tip - "Enjoy the challenge." Would play every week if I could afford it. Fantastic venue and the clubhouse is great. Food is expensive but the Ryder Grill was well worth the money. My Caddy Tip - "Go for it at 10." 10 on the Brabazon was brilliant. All holes were good, some were great. The 10th and 18th stand out, despite the difficulty. Hotel very good, staff very helpful and pleasant. My Caddy Tip - "Don't need a driver on most holes, and accept your own limitations." Great pro shop and facilities well organised. Want to go back to play the Brabazon. Bottled out of trying to drive the infamous 10th hole on The Brabazon, still walked off with an 8. Loved every minute and every shot, no matter how bad. A very enjoyable and difficult challenge. My Caddy Tip - "Tricky greens so concentration is paramount." Overall we had a fantastic break, played the Derby which was a nice easy layout. This prepared us for the test that was the national on the following day, where we had a great time. Safe to say we are returning in 2016. The golf courses were immaculate as was the hotel. Overall, it was all fantastic! The best hole has got to be the 10th. The dream hole for a fader. My Caddy Tip - "Greens are quick. Lay up on 10 to leave an easy chip over." My Caddy Tip - "Keep it on the short grass." Too many good holes but the 10th and 18th stand out because they are the ones I have always wanted to play and remembered from previous Ryder Cups. Unfortunately I played them like a 26 handicapper but that's the beauty of golf. The hotel accommodation was excellent, although food and drink was slightly expensive. My Caddy Tip - "Keep the driver in the bag for a lot of the holes." The Brabazon has long carries from a lot of the tees for the ladies, so it is not for the feign hearted. If you are new to golf then The Derby is kinder and as you progress the PGA gives more of a challenge. The golf shop is brilliant with a wide range of ladies clothes, I always pick up a bargain. Famous 10th and 18th. Hotel accommodation was excellent. Loved both championship courses and really couldn't pick a favourite hole as they were all very challenging. I played the PGA in 7 over par and was chuffed to bits. My Caddy Tip - "Just hit all the fairways"
Hotel recently had a major refit. Played the Brabazon and Derby. A good time had by all. My Caddy Tip - "Know the line off the tee on the Brabazon 18th." The 18th hole is one to savour. 10th Hole at Brabazon was my favourite. Hotel was good and relaxed. Played the Brabazon course- poor condition of the bunkers, with large stones in several of them. One of us damaged his sand wedge playing out of a bunker. Also slow play, with the guide times not being adhered to by the group in front of us. We were approximately 25 minutes outside the guide time after 9 holes. I brought this to the attention of the course marshal at the 10th hole, who took no action. The above split the day that we had looked forward to. My Caddy Tip - "Good and tricky greens make it essential that you give yourself the best opportunity of placing your ball in good positions on each green." Played Brabazon and PGA, both in great shape. Prepare your budget for overpriced food and drink, get used to that and it is a great venue. The 10th is the most memorable hole for obvious reasons. The 18th is great because of the way it comes back to the Clubhouse. The hotel is superb and the staff were far from snobby, they'll do anything to help your stay memorable. Would recommend The Belfry to anyone. My Caddy Tip - "Greens are very slick and take some getting used to." Everything about this trip was fantastic, even Tony Jacklin stopped in for dinner. Don't go it is completely rubbish. The hotel is abysmal - damp smell full of stag do's, although the food canteen was quality. The Brabazon was average. My son and I played both the PGA and Derby courses over 2 days. Initially, we had an hour at the driving range- the auto ball feeders are brilliant. On both courses we were able to stay as a 2 ball, however it was very busy, bad queue at the Derby tee off, and constantly being closely pursued by the following playing group. Both courses and greens are very good. Golf shop and staff/reception staff were very good and welcoming, and the allocated bedrooms are excellent. The Belfry restaurant is quite expensive and Sams Club house appeared to be a better option. However, it was under staffed with disgruntle personnel. The food when it appeared, was nothing special. We stayed for lunch on the second day, but shouldn't have bothered. We will go back for the golf next year but probably eat out. My Caddy Tip - "The greens are extremely fast." A tough couple of courses in the Brabazon and PGA, but what an enjoyable 2 days- the hotel was very comfortable the staff were very helpful and nothing was too much trouble for them. All superb- courses, organisation, night club, breakfast. Would do the same again for the same price. My Caddy Tip - "Practice your putting." Brabazon is the best but I found the PGA course to be the toughest. Derby course is a good warm up to get you ready for the other 2. My Caddy Tip - "Play it safe if you want to keep your balls." Don't play out of season to get the best out of the course, as otherwise the weather will beat you and the course will be a bit too tough. In the summer, it will be fantastic with some super holes. Placement of your balls is a must. Most holes are easier than you think if you're careful of the water. Drivers and irons have to be straight. The greens very good. My Caddy Tip - "Walk the course the first time you play it." Good accommodation and great courses. Buggies are expensive if you can't walk the course. The signature holes on the Brabazon were great, 10th and 18th in particular. My Caddy Tip - "Greens are tricky, make sure you have a practice putt." Loved it. But maybe next time I should try to go when the weather isn't quite so frosty. Course was brilliant and the hotel class. My Caddy Tip - "Tricky greens." The 10th is awesome - Seve hit a 3 wood off the blues! I hit driver off the whites and yes, I hit the green. Hotel was fabulous. Take plenty of balls. My Caddy Tip - "Greens are very fast but true." The derby is a bit boring compared to the PGA but it is still a good warm up for the Brabazon. The Brabazon is tough, long and you are punished for missing fairways or greens with plenty of water and long thick grass. The renovations to the bar area are great and the accommodation is fair but not great. An evening meal and breakfast was included on previous trips but on this trip the evening meal was gone and the bar prices were too high which was a shame. I always enjoy the trip though. My Caddy Tip - "Keep the ball in play by not taking risks." Walk in the steps of the greats. My Caddy Tip - "Go for the green on 10." 10 and 18 will give you a great time. All greens are great to putt on. My Caddy Tip - "Trust your putting stroke on the greens." Rooms were good, plenty of space. Buffet was okay, but we went in late so it was probably our fault. Breakfast was very good. Both courses were excellent and the Derby was better than I expected. My Caddy Tip - "Be aggressive on every hole." 3rd and 18th were my favourite holes. Stay away from the water. Hotel was great, leisure facilities are excellent. The 18th on the Brabazon is steeped in history, the shot over the water for your approach is fabulous (providing you make it!). My Caddy Tip - "Greens are tricky. The 18th green is a four putt if you don't land it in the right spot." A trip not to be missed. Great courses, accommodation & experience. Already planning a return in 2016. My Caddy Tip - "Play for position." All of the courses are spectacular. My Caddy Tip - "Practice putt." Course great. Hotel poor. Sports bar closed too early. Evening meal was very poor. It was an enjoyable weekend with the family where I was able to play golf and they could use the leisure facilities. It was my first time playing the Brabazon Course and it did not disappoint, though the pace of play was a little slow. The Derby which I played second was a perfectly acceptable and enjoyable course. The Belfry offers a stylish weekend break in very pleasant surroundings. However, it was a little pricey - £680 for 2 nights with my wife and 11 year old son. Hotel great. The greens on the Derby were crazy fast, although tee to green was pretty straight forward. 18th was a great closing hole. The hotel needed a make over which it got a couple of months after we visited- not been back since. Had a 2 night stay and played each course. The Brabazon and PGA are great courses. They have fast greens and are both in great condition. Derby is fun but nowhere near the standard of the others, beware though buggies are £45 to hire. Enjoyed all three courses. You need to be on top of your game for the Brabazon, it's a tough track with fantastic layout. My Caddy Tip - "Don't put pressure on yourself with miracle shots, plot the course to play to your handicap." PGA much better than expected. Brabazon was nice but overpriced. Great course's. Pace of play can be slow. Bar and food unnecessarily expensive. However, I had a very enjoyable weekend. My Caddy Tip - "Club up. Large greens mean that one more club is often required." 10th on the Brabazon was excellent. Best holes are the 9th, 10th and 18th. Make sure you have a yardage book. The hotel was good. My Caddy Tip - "If you can hit it far enough then why not have a go at the 10th Green." Great hotel and surroundings as always. Be prepared for the expensive food and drinks, sadly it goes with the territory. Hotel great, golf course absolutely fantastic. Food lovely, been many times and will return, many iconic holes, just a joy to play, 28 played and had nothing but praise for the whole place. My Caddy Tip - "2 irons on 10 no brainer." The Brabazon course was in excellent condition, although this is the second time I have played it and I find it a tough course. I am not a big hitter, so for a lot of women, getting to the par 4's in regulation can be difficult. The National course is ok, but the Derby is somewhat of a Farmers Field. Hotel and food was good. Great hotel and bar facilities along with some truly iconic holes, the 10th being a stand out. Course condition and lay out superb. My Caddy Tip - "Sacrifice distance for accuracy. The course isn't short but can punish inaccuracies off the tee"
Standing on the first tee the feeling of 'this is it' hit me! All the modern Ryder Cup greats have hit that shot- Seve, Watson, Faldo, Woods and now me. The blood was really pumping as I tried (in vain) to drive the 10th. However, the scrambling par got me a '4 for 3' The new(ish) par 3 12th is a beautiful hole with nothing but water to admire. When we finally arrived at 18 (the 18th, some would say), my partners tell me they've never seen me so intense on a drive (I really wanted a 4). Anyhow, my missed four footer condemned me to a bogey and it was off to Sam's Bar for beers and endless chats of what might have been. My Caddy Tip - "Greens like glass- leave uphillers." Hotel and facilities were fantastic and the courses were in great condition. Although the courses were also challenging, they were not too difficult for a 19 handicapper to enjoy. The problem was that there were too many people on the course, waiting at every shot was not ideal and led to long round times. I'm unsure if I would go back because of this. Great golf destination, I would recommend upgrading to play the PGA and Brabazon. Upgraded and played the Brabazon. It was well worth it and I had a great game, the course was in great condition. The hotel and staff were fantastic and very accommodating. The food and rooms were also brilliant. They were all outstanding through the history of the Ryder Cup. 10 and 18 were my favourites. My Caddy Tip - "Be aware the greens are like putting on lino." Hole 10 on the Brabazon is a must play for any golfer. The greens were magnificent, the 10th hole and the 18th green are absolutely fantastic. Handicap - Scratch or better. My Caddy Tip - "Don't use a driver on the 10th." All of the holes were brilliant. Great location and now the hotel has been re-vamped it matches the quality of the courses on offer. Hard to top the 18th if you can play it from the back tee's. There's a very good sports bar if you want to relax after a testing round. My Caddy Tip - "Be sure you play the Brabazon and PGA courses"
I liked the set up with the rooms and the external lounge. Restaurants are nice, but hard to get a table. Night club was a bit empty. My Caddy Tip - "Course plays longer than you think." The first par 5 saw me walk away with an Eagle. Considering its challenging fairway sloping and bumpy green, I'd call that my best hole. The course was fine, although the fairways were not of the standard I was expecting. My main concerns relate to the hotel and service. We were unable to have dinner as it was fully booked (you did warn us) and frankly I felt the whole ambiance of the place was lacking 'soul'. In addition there was nothing else to do at the venue such as pool, table tennis, etc. Can't fault the golf but the venue was a shambles. We were stuffed in some basement area a long way from anything else. Hopefully it was an old wing that has been demolished and rebuilt. If you are playing two courses, play the Brabazon first. The others are easy in comparison. My Caddy Tip - "Unless you can clear 200 with your driver, use the Ladies Tee on the 18th." 10th and 18th were great. We all enjoyed both course's and the service in the hotel was very good. Good food and the rooms were of a very good standard. Would definitely go back to play both courses. PGA was a pleasure to play. Derby is a steady course. Just the Brabazon left for me to sample, hope to play it in the not so distant future. Great Hotel and facilities. Having an on site night club, (Bel-Air) is a massive bonus. My Caddy Tip - "Make sure you hit the fairways." Brabazon- all greens of superior speed and quality. It gave our group of 16 an insight into the type of greens that the pros face week in week out. They beat us up. Our best score was 30 pts stableford for our group of touring Kings Lynn golfers. Glutton for punishment. Can't wait to return to be beaten up again. No weak holes but some are a welcome relief. The obvious gems are the 9th and the 18th. For anyone playing for the first time there are potential water hazards all over, so bring plenty of balls. Don't travel far to play the Derby. Hotel was excellent. PGA, and Brabazon were excellent. Hotel was nothing to shout about and you should be able to see more about the Ryder Cup. My Caddy Tip - "Greens are fast." All 3 courses held different challenges from easy to professional. Restaurants were good value & there was plenty of choice. My Caddy Tip - "Take distance checks." Love the Brabazon and lots of interesting holes. Played the PGA, although it was a bit tough. I would like to try the Brabazon sometime. Very much enjoyed our trip to the Belfry. The two night bed and breakfast break in the hotel, with a round of golf on each of the three courses was ideal and great value for money. Particularly enjoyed the PGA National which is a great course and less tough than the famous Brabazon. All courses were good tests of golf and in excellent condition. Staff at the club and in the hotel were very helpful and courteous. Rooms in the hotel were very clean and comfortable. The drive down from Scotland was straightforward, fairly quick via the Toll Road, and the resort easy to find. Would definitely recommend the Belfry for a golf break and hope to return soon. All the arrangements through Yourgolftravel went entirely according to plan, and we had a great trip. My Caddy Tip - "Don't try to carry the water on Brabazon." Disappointed with the restaurant. Caddy Masters were lovely. My Caddy Tip - "Lay up on the 18th and take lots of balls." Hotel was great. The food was brilliant- very good breakfast and a 3 course evening meal was even better. The drinks were a little on the expensive side as was the golf shop. Both the Derby and Brabazon was in great condition. Overall, the whole place was clean and tidy and very pretty to look at. We played the Brabazon which is always in fantastic condition. First time playing The Belfry, the Derby was flat and not challenging. Rest of the venue was first class including the room, food and atmosphere. Would go again tomorrow if I could play the "Big Boy" courses. Excellent venue and also good for non golfers. I don't play golf but my family did and I enjoyed the Spa treatments. Having played most of the top courses in the UK, I have to say the Belfry is brilliant. I played the PGA & the Brabazon last year & we could not wait to get down again this year. To play the famous 10th hole was a treat. The fairways are perfect and the greens are very fast. Can't wait till next year. Hotel was first class too and the belair night club on the resort is a must. My Caddy Tip - "Hit one more club than you think." Hotel was great. Enjoyed all the golf. Staff were very friendly. Tremendous golf trip. Great golf, superb weather and the hotel was fantastic. The food was the best I've had in a hotel. I will definitely go back. Still not sure if it's better to lay up or go for it on the 10th. The par three's were fun to play. The hotel and food were great, but the drinks were too expensive. Playing the Brabazon next weekend so cannot wait for that. My Caddy Tip - "Play within your means." 10th hole was brilliant. The hotel was very good. My Caddy Tip - "Use the drive." I think the PGA national is a better overall course than the Brabazon, apart from the feeling of playing the 10th and 18th of the Brabazon "iconic holes". Overall, a great place to stay and play. 10th was my favourite hole. My Caddy Tip - "Don't take out the driver on 10th." My Caddy Tip - "Play long on par 3's." Hotel good, food good, beer good. Hotel and food good. The only problem was the holy tinning the greens, which was a bit upsetting. We know they have to do it but that is why I rated it 4 instead of 5. My Caddy Tip - "Concentrate"
Just take your time and soak it up. Fantastic. My Caddy Tip - "Don't hold back and wish that you didn't on the way home." The Hotel accommodation was poor and there was no fine dining which ruined it for my wife as it was her birthday. This venue was only suitable for groups of men. The championship course was great and well monitored. However, the PGA course was ok but not monitored and as a result it took 5.5 hrs, finishing in the dark. 10 and 18 on the Brabazon are fantastic holes and although the course is very challenging, it's a joy to play thinking of all the great players that have played there in the Ryder Cup. My Caddy Tip - "Buy a course planner in the pro shop and be mindful of the water on the front nine. If in doubt lay up." All of the courses well groomed and very well presented- a credit to all of the staff. A very enjoyable stay, with two days of great golf and hotel staff out of this world. My Caddy Tip - "Stay out of the sand." Don't expect it to be easy. My Caddy Tip - "Make sure you use enough club on raised greens." Derby course poor. Evening meal poor and unable to change to main menu. Wouldn't go back. We enjoyed our stay. The food was good. Great breakfasts. Rooms ok. Staff in pro shop very helpful, as were the starters on the courses. We will return at some stage. Brabazon course fab, but hard for 19 handicap lady. My Caddy Tip - "Enjoy, look around." Enjoyable courses. Hotel and food excellent. Excellent trip all round. Great value in hotel. Very good staff, food and accommodation. Golf courses in great condition. Will go back again. Hotel overpriced the food and drink. Lives on the back of the Ryder cup and there were a couple of signature holes standards on the course slipping. Paying more for the privilege. My Caddy Tip - "Keep the ball below the hole on 18." The courses were in great condition and the food and company were excellent. All for £99- great value! My Caddy Tip - "The greens were superb." 1st, 3rd, 10th, 12th, 14th, 15th, 16th, 17th, 18th brilliant holes.Played there four times years ago. I played the back nine to par and played a four iron from Christy O'Connor's marker to four feet from the pin on 18th. If you like food, you'll love the food here. Some brilliant rooms and the staff can't do enough for you. Tip: use your handicap, practice your putting before you play and don't use your driver. My Caddy Tip - "Greens are tricky but true. Play most greens to the front for up hill putts." Great golfing venue, all 3 courses are excellent. Friendly atmosphere with very helpful staff. First time at the Belfry and what a excellent venue for a short golf break. The courses are all in great condition and challenging in their own way. Great hotel, good food amd will be back year on year. Brabazon is a great course. Derby is okay. My Caddy Tip - "Enjoy your game and go for everything." The 10th was a great hole. My Caddy Tip - "Take your time and try not to play the course the way the pros play the course." Brabazon 10th was my favourite hole. My Caddy Tip - "Go for it on 10th." Hotel and venue excellent for an overnight stay for a special occasion. Wives used the spa facilities while we played golf. Good to play the Brabazon course and the famous holes from the Ryder Cup, but for the amateur golfer I thought a previous visit to play the PGA national was better value for money. Favourite hole would be the 10th. I would go back midweek, as a bit noisy at the weekend. PGA course was almost like a links course, with some really fast greens. We loved every minute of the time spent at the Belfry so much that we are looking to re-book as soon as possible for next year. The night club on site was great, especially with the additional security on the front door, made you feel really safe. The hotel was fabulous, the food was amazing. A great weekend. My Caddy Tip - "Pitch up short of the green, it'll roll on." Every hole was a challenge but a great challenge. It was amazing to play the 10th. A fantastic experience which everyone thoroughly enjoyed. My Caddy Tip - "Stay focused and trust the yardage." 10 and 18 were my favourite holes. Very friendly staff and the courses are great. My Caddy Tip - "Practice your putting"
Favourite hole was the 18th. Just enjoy it. The hotel and staff were very good. My Caddy Tip - "Play it the way you read it." 10 on Brabazon the highlight, particularly if you go for the green. 17 and 18 on Brabazon are really good finishing holes. Brabazon course was fantastic. Derby course was very poor in comparison. Hotel had just been refurbed and was very impressive. I loved every hole on the course. I would find it very hard to choose a single hole over another, but at a push it would be the 18th on the Brabazon. Tip: hire a buggy and if you play the PGA course try to stay out of the bunkers. I thought the hotel was great but the golf shop was very pricey and that was the only down side. My Caddy Tip - "Stay out of the bunkers." The 10th on the Brabazon is my favourite, Start on Derby, and then the PGA National. Leave the best and hardest to the last- Brabazon. My Caddy Tip - "Lay up on the 10." All the holes are good on the Brabazon, and I also enjoyed the PGA. Hotel was good and enjoyed the food. My Caddy Tip - "Be conservative and watch out for the small water hazards across the fairways." Good hotel accommodation but very expensive coffees in the bar. Good courses and all the better for getting a par on the signature 10th. Would go back, but only after visiting the other courses, as your golf travel has recommended many good alternatives. PGA course and hotel were excellent but I would not recommend the Derby course. Very frosty so had to carry clubs. Found the Derby a little disappointing compared to the PGA, but will return depending on the costs. 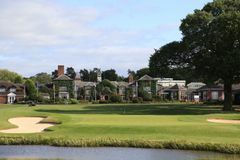 We thought the hotel was fine, but having played the Brabazon before, we thought the course was in no way near in as good a condition, which was a great disappointment. Good fun trying to win a free round on the tough par 4. The hotel was fantastic but the drinks and food were expensive. Overall a fantastic venue. My Caddy Tip - "Stay out of the water." The Brabazon course is a great test of golf. The 10th and 18th holes are particularly memorable from Ryder Cup days. There are no weak holes. If you score more than 30 points you know you've played well. It is a must play course. The PGA course is also a great course. I played the Derby course on a previous occasion but I would recommend upgrading to either of the other 2 courses. The Hotel is excellent. We ate in the restaurant and the food was very good. My Caddy Tip - "Good course management is a must"
Awesome course. It was an honour to play the Brabazon. 10th looks easy but it isn't! My Caddy Tip - "Greens are quick. Practice beforehand"
Hotel was very good food- a bit pricey, but drink was priced ok. It had a very nice refurb. My favourite hole has to be the 10th. My Caddy Tip - "Don't try hitting a 60 year old 2 iron for your 2nd shot on 18." Great courses. Lodge accommodation (by PGA) just right for our group. DBB package ideal. My Caddy Tip - "Putt well." The upgrade on the accommodation is generally good, but probably designed by a tall man. As a 5ft 3in woman I found the mirrors and some furniture was too high. Derby and Brabazon courses were in good condition. Fun to play if somewhat slow. Staff welcoming and helpful. Interesting companions from St Helens RLFC. My Caddy Tip - "Take more club than you think." Really like the whole set up of the courses and also the hotel itself, along with the food. My Caddy Tip - "Go for the green on the 10th." Your golf travel is fine. The Belfry is overrated. My Caddy Tip - "Don't give up"
Despite being crowded the weekend was great. A little impersonal at times but well worth doing if you love your golf. My Caddy Tip - "Play to your handicap." Courses were fine but accommodation was less than satisfactory. Hot rooms with a tiny fan for air conditioning. In a room over the large generator that makes noise all night so you can't have the windows open. The problem with The Belfry for me is the impersonal nature of the hotel complex. It is far too big and busy for a quiet golfing weekend. I hate to say this (and I am not naturally snobbish) but there were a large number of rather oikish people staying at the hotel on this occasion. There were also some rather badly behaved golfers on the course. An example: being practically knocked for six when walking through some swing doors by a rough type who didn't even apologise, then holding open a door for a guy carrying a tray of drinks who didn't even look at me let alone thank me. On the course we were pressured from behind in a rude way when there was a group in front of us within range. So don't go there unless you can avoid these types. I would love to play The Brabazon again on a quiet day with no pressure. My Caddy Tip - "If you have a high handicap don't attempt to get pars. Play the par 4s as 5s etc." 10th and 18th on Brabazon were brilliant. Tip- pretend the water isn't there. My Caddy Tip - "Relax and enjoy." The Brabazon is a fantastic course, and certainly met expectations. On day two, we played the PGA National. It absolutely poured with rain, and there were high winds, and it was absolutely no fun whatsoever! I doubt I broke 150. My advice- if it rains, go to the bar. I remember the tees were at the back and looking at a 180 yard par 3 over water, thinking I may as well just throw this ball into the water. The 12th was a real low. Straight into the gale, it was around 550. It should have been a par 8. We all took at least 6 to reach the green. The hotel wasn't in great condition, however I believe it has been renovated recently. Overall, I'd recommend. My Caddy Tip - "Take an old ball to play on 10. Very, very, very few of you will reach the green." Brabazon and PGA were in very good nick. Perfect set up for a group getaway over the Masters weekend. The hotel was brilliant and the food also great. The Brabazon course was mint. I would advise to play the PGA instead of the Derby course. My Caddy Tip - "Super fast greens. Need putting practice before the Brabazon." Loved the whole weekend, the only thing I would say is that the food hall was far too big which meant there were about a couple of hundred of people, so it was very noisy. However, it was some of the best food I've had on a golf break. Hotel was very good and I enjoyed all 3 courses. My Caddy Tip - "PGA needs good course management." My Caddy Tip - "On the Brabazon, read the course card and follow it to the letter." Preferred the Brabazon course, the food and accommodation was great. I look forward to going back again. My Caddy Tip - "Greens were tough." Hotel looking a bit dated. Could do with a refurb. My Caddy Tip - "Play course to your own handicap." PGA course was a good challenge with very fast greens. Good hotel and service. Thoroughly enjoyed the stay and the golf. Overall a good venue with great facilities, but it was Autumn and the greens hadn't been cleared of debris that day. Putting was impossible on some holes. Couldn't pick a favorite hole. The course was in great shape and our group are planning a return in the near future. Hotel of a very high standard staff and they very friendly and helpful. The staff were also great in the pro shop and on the course they were very courteous. My Caddy Tip - "Think before you play any shot as its all about course management." The Belfry was £99 for a B&B and 2 rounds of golf. Lunch and dinner with drinks added was £85 for 2 people. The biggest pro shop with the latest gear was impressive & we were served efficiently and politely. The Derby, the easiest of the 3 courses was flattering to my game. The back nine are more interesting than the front and the course is good for all abilities. The tee boxes, fairways and greens were in ok condition. The PGA national: great condition, challenging and had character with water/ditches and some lovely vistas of great English countryside. No pin positions on either courses. Pull trolleys were expensive at £7.50. The range was excellent with automatic ball tees, great large mirrors and £5.50 for 50 balls which was ok. We ate in Sam's clubhouse which was reasonable for food (pizza £10), but pricey for drinks. A large Cappucinno was £4.95 and a pint was about the same. Staff were very helpful. My Caddy Tip - "Get a course planner." The room was very hot and needed air con. Both the PGA and Brabazon were great courses. My Caddy Tip - "Stay on the short stuff." All of the holes had a great quality about them. Have been there three times and despite it being summer, is has rained or snowed (yes, snowed on!!!) on each time. Hotel is OK though it has since been refurbished. The food is fresh, plentiful and with good variety. Bar prices are high but not London levels. The changing facilities were small but well appointed. I don't rate the Derby Course - unimaginative and no better than many a municipal. PGA is as at least as good as the much vaunted Brabazon. My party thought the Brabazon is a bit over-hyped and a bit of a slog. Perhaps getting soaked coloured our perceptions! We did in fact get snowed off in July and got vouchers to return and play again. The shop staff were somewhat dour. My Caddy Tip - "Make sure to pack waterproofs and a stout brolly." The Brabazon and PGA were great courses, while some holes were very tough, others were much easier. The hotel, rooms and food were all great. Staff first class. My Caddy Tip - "Don't go for the green on 10, good chance of a birdie if your 2nd shot is good"
The hotel was undergoing extensive refurbishment at the time which we were not told about. This time we played the Brabazon and the Derby. It was a better package when it was the Brabazon and the PGA. Dinner seems to have been removed from the packages which is a shame because the process remained the same. Nevertheless, great fun playing the Brabazon and recalling the Ryder Cups. The 10th hole is iconic but my favourite hole is the last where you have to decide how much corner to cut off the tee and then over another daunting lake to fly onto a 3 tier green. If in doubt play safe off the tee and lay up with your second. We played a 4BBB on both days which is a fun way to play the courses, especially the Brabazon. My Caddy Tip - "There are some long carries over water to watch out for." All the staff treat you so nicely, including the green staff. Came home feeling we were special. The Brabazon a real challenge, but great to go and play. Very enjoyable short break away. The Belfry is a fantastic course, the PGA was a good 2nd best and the hotel had everything you could want on a weekend break- swimming pool, jacuzzi, etc. I was a bit disappointed in the lack of choice with the whiskeys, but that might be me being fussy. On the 1st, 10th, 13th and 18th keep your ball on the fairway and have plenty of practice on the putting green beforehand. My Caddy Tip - "Keep your game to your level"
I played the Derby course, which was fine and stayed in the Jacklin rooms, which were basic but ok.
10 and 18 on the Brabazon were great holes. Play the PGA or the Derby first. Save the best til last. Hit a driver on the 10th-it has to be done. My Caddy Tip - "Hit straight and putt confidently." My Caddy Tip - "Hit one club more than you think." Great couple of days of golf with my son. Will certainly be going back. Great facilities and a wonderful place to play golf. Will certainly be coming back. If you have a choice play the holes 1 through to 18. Don't start on the 10 but when you get there go for the green. My Caddy Tip - "Use a driver on 10." The Belfry is efficient and well run in all respects. Not enough trees and too many bunkers. Number 10 was the stand out hole. Obviously 10 and 18 stand out in the memory on The Brabazon even if you have only ever watched them from the Ryder Cup. The quality of the greens and bunkers are immaculate, not to mention feeling guilty whenever you take divots from the fairway. Played it 3 times now and can't wait to go back again, especially now they have refurbished the hotel it's even easier to talk the wife into going! My Caddy Tip - "If you think you can reach, you have to give it a go on the 10th!" My visit was over 2 years ago so a review would not be relevant to the venue at this time. My Caddy Tip - "Study the course and stroke savers before you play "
Didn't really have a favourite hole as every one was a challenge. I was so impressed by the condition of the course- the fairways, greens and water hazards. Although, being a high handicapper I didn't think I would. Classic course in great condition, plays long but fair. The greens were very slick! Hotel and food were good but the drinks were expensive. My Caddy Tip - "Just rip it." Best golf trip I've been on, everything was brilliant. My Caddy Tip - "Avoid the bunker on the left of 11." The Belfry is an excellent venue with good accommodation, food and golf. However, the prices on site are extortionate. Otherwise it would be 5/5. My Caddy Tip - "Course management a must." Played behind a corporate party which took 6 hours and it rained all day. Visited before renovations. Hotel was a bit tired. Brabazon was good to play for the history but there are better courses out there. I like the Brabazon but the PGA is a great course too. The hotel is good with the only downside being that the food is not included. However, there are plenty of other options- we had bar food. Everything about the Belfry is fantastic. If you love golf the Belfry is the place to go. The history of the tenth hole on the Brabazon means you got to have a crack at the green from the tee. My Caddy Tip - "Don't leave the ball above the hole on any green." The Brabazon should be on your list of courses to play. It is hard but really worth the effort to get round it. As an old member said as we came off the 18th of the derby course the day before, 'take plenty of balls and you'll really enjoy it'. In the end I was 3 balls down but having birdied to 10th I will be back again some day soon. The food is excellent, and the accommodation was certainly better than most. There has been construction works during my 2 trips to the belfry but at no point did it affect our stay or play. My Caddy Tip - "Lay up for the big water." Hard, but thats what you play championship courses for. My Caddy Tip - "Try to stay on the fairways." Brabazon and PGA National were ok courses. Marshall's were over helpful on the first tee, considering we've played before. Challenged too much just to play off white tees as the majority of us our single handicappers and and there are two pros in our group. Hotel facilities generally good but we ate in the bar because we were watching sport. The nightclub was ok. Breakfast pretty good too. Generally happy with the resort. My Caddy Tip - "Don't use a driver in a number of holes if you are long off the tee." Played the Derby 'to ease us in'. Then the PGA on day two!! Now ready for the Brabazon... Accommodation also first class. My Caddy Tip - "Don't panic." The hotel was tired and needs updating. Spacious room. Paired up to play both the PGA National and The Derby Course, but didn't play the Brabazon. The Belfry is like a golfing conveyor belt with 4-balls going out on the courses like clockwork every 8-10 minutes. Favourite hole has to be the 10th & 18th on the Brabazon, memorable holes! Great hotel and fantastic facilities. I will definitely look to return as soon as I can. Actually quite an average course. Over sold to people who just want to tick that they have played there. Our round took over 5 hours, playing behind 8 ladies who held up the entire course. We had no assistance from the marshals who refused to hurry them along. Do not be overawed. Treat the course with respect. Do not complicate your playing of the course, keep it simple. Down the middle and center of the green will get you round. Play within your ability. The hotel was fine, breakfast was very good, with very helpful staff. Preferred to drink and eat in the Sports Bar next to the Pro shop. I found the benefit of using a Buggy on the Brabazon, outweighed what I considered to be the expensive cost. My Caddy Tip - "Keep it simple." Just go out and enjoy it. My Caddy Tip - "Go for the 10th green." Wanting to go back as soon as possible. The tenth is a fantastic hole on the Brabazon. Enjoy the course, some great player's have played here. The hotel, staff, and everyone involved with the belfry were spot on and we enjoyed every minute. My Caddy Tip - "Go for the green on the tenth." The hotel & food were ok but very expensive, particularly drinks and coffees. None of our party really enjoyed the trip. The other course was very poor. Tough course but well worth a visit- we played the Brabazon and the Derby and enjoyed both. My Caddy Tip - "Hit up the middle!" Hotel and food were fine, drinks a bit expense though. I have played all 3 courses and enjoyed them all, they have different characteristics. My Caddy Tip - "Long holes, so good length is required. Also, club selection is important with the approach shots into greens as they are very large." The Brabazon was exceptional and the PGA National was first class. The hotel rooms very good, although a little hot. Ryder Grill is a little disappointing. It felt a little like an average buffet. My Caddy Tip - "Make sure you have your "A" game for the Brabazon." The hotel, having been refurbished was smart, comfortable and enjoyable. The Brabazon does have an ambiance of its own with memories of past Ryder Cup matches. However, if you are not as old as me I don't think you would feel the same way. Holes 10 and 18 remain two of the most iconic holes in golf and is a reason for playing the course alone. On the negative side, the course was too crowded when we played it. It took over 5 hours for the round and the venue was pricey. My Caddy Tip - "Take your medicine and manage yourself round this course"
All 3 courses are worth playing. Each has a different challenge. I am the highest handicap player in our group but felt quite at home on all 3 course's. Great value, considering the evening buffet meal was included in the price. We will certainly be back in the near future. My Caddy Tip - "Just play within your capability." On the first day of our stay we played the PGA course, where we were joined on the tee by two nice men who had never played golf before. We spent most of our time looking for balls and trying to explain the rules of golf. The food was good, the room very dated. Superb accommodation with even better courses. Playing the 10th was amazing, because of its history with the Ryder Cup, especially with Seve Ballesteros. My Caddy Tip - " Keep it to the fairway, don't try to drive too far. " The course and hotel were excellent. This deal, which includes dinner, is great value. I would not go back without the dinner being included though. The Brabazon was a beautiful course and the Derby was okay. The hotel was superb, only the food and drink were very expensive. The buggies were also expensive, but well worth it, particularly for 1st time players. They have gps computers which are fantastic. The courses were in great condition but the hotel's bar prices were too high. I would recommend staying down the road. My Caddy Tip - "If you're here for a memorable round, then try and make it truly memorable and drive the 10th green"
The Brabazon was a lovely course, with some iconic holes. A real treat. The Derby course was very plain and no better than what many club golfers would play at home. I would love to go back and see how the refurb has gone. The Belfry is a fantastic venue which was going through an extensive refurbishment when we visited. If the upgrade of Sams bar/clubhouse has gone as well as I hope then you are in for a treat. As usual, the Brabazon was in fantastic condition and in my opinion, it is underrated. However, I have struggled both times that I have played it. My Caddy Tip - "Be prepared, it is a punishing course." Awesome trip, fantastic facility, good food, good wine and quality courses! The Brabazon is out of this world! Highly recommended to others. My Caddy Tip - "Take time to read the large greens, some unforgiving speedy slopes." I've been to The Belfry twice now, mostly recently in August 2015. They have done a big refurbishment and the hotel is now looking as fantastic as the courses. The PGA is a great course. It's long so tougher for those, such as myself, on higher handicaps but it's still a pleasure to play. The greens are always in superb condition. My Caddy Tip - "I would lay up on the 10th if your not too confident." The courses were good, albeit quite busy whilst we were there. The Brabazon course was all it was expected to be. The Derby course was okay but very dry. The hotel was lovely. Although, I think the food and drinks are overpriced, but that is to be expected at such a resort. Overall, I am very happy and would definitely return. The hotel was a bit tired. My Caddy Tip - "Keep it in play." Very enjoyable venue in all aspects, with three varied courses. Staff, food, etc. were all good. My Caddy Tip - "Greens are very fast, so have your putting game with you." PGA is a tough course. The derby is more like a municipal course, not very well maintained. My Caddy Tip - "Keep on the fairways." The Brabazon is such a wonderfully kept course. From tee to green it's really not that tough, but if you get the ball on the wrong side of the green it will test anyone's putting! The hotel is a little dated; The bar and staff have lost their friendly appeal from a few years ago. My Caddy Tip - "Greens are quick and true." The hotel was fab and the course was in great condition. The staff were very helpful. The Belfry is the 6th championship course I have played and I think it was the best. My Caddy Tip - "The Greens are true and fast." The main draw back with the Belfry would be the layout of the hotel. I know it's a big place, but it's like a maze to get from your room to the golf pro shop and the restaurant. I would leave plenty of time to check in at the pro shop and get to your tee on time. Overall, I would recommend going there, especially on a deal which includes the Brabazon course. My Caddy Tip - "Beware, the greens are fast." If the offer ever comes available and you love golf, don't miss this opportunity.